1. Heat the oil in a large frying pan and gently cook the onion and peppers for 10-15 minutes until very soft and golden. for 15-20 minutes until golden brown and cooked through. 3. 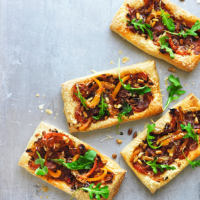 Toss the rocket with the balsamic vinegar and a little olive oil and scatter over the tarts to serve. For a meat-free version, substitute the chorizo for semi-dried tomatoes. You can also make smaller tartlets for party nibbles – only cook for 10-15 minutes. This recipe was first published in Thu Oct 27 10:27:05 BST 2016.